Magnetic instant screen door curtain opens and magically snaps closes behind you using strategically placed magnets. So if your hands are full or you have a forgetful family member, you can still let fresh air in and keep annoying bugs out. It goes up in seconds with no tools required and stays up all season long. Plus it folds up for easy storage. Fits single doors, sliding doors, RV's and more! Instantly opens, magically closes. Great for pets too! This Magic Mesh Curtain installs in seconds, with no tools required. Magnetic mesh keeps fresh air in and bugs out. This Curtain door cover instantly opens and magically snaps closed behind you. This Mesh door lets fresh air in but keeps the bugs out. 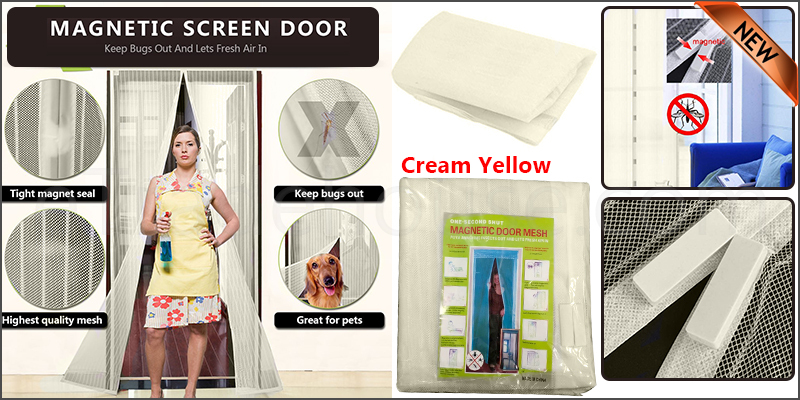 Magic Mesh fits in both standard and sliding door frames and "magically" snaps shut behind you. With powerful magnets, this Mesh closes quickly and automatically, even if your hands are full or your kids forget to close the door behind them. It also closes gently and quietly, eliminating slamming doors and screens. Magnetic Mesh is great for pets--your dog can come and go, and it will close on its own, keeping bugs out of your home.